A yellow, jewel-toned quick bread topped with candied ginger makes this a delicious treat you can enjoy on the go. Total time: 1hr. 20 mins. Preheat oven to 325°F (160°C). Grease non-stick 9 X 5-inch (2 L) loaf pan well; set aside. Whisk coconut oil with honey until well combined. Whisk in eggs; beat well. Whisk in kefir, fresh ginger, turmeric, baking soda and vanilla. 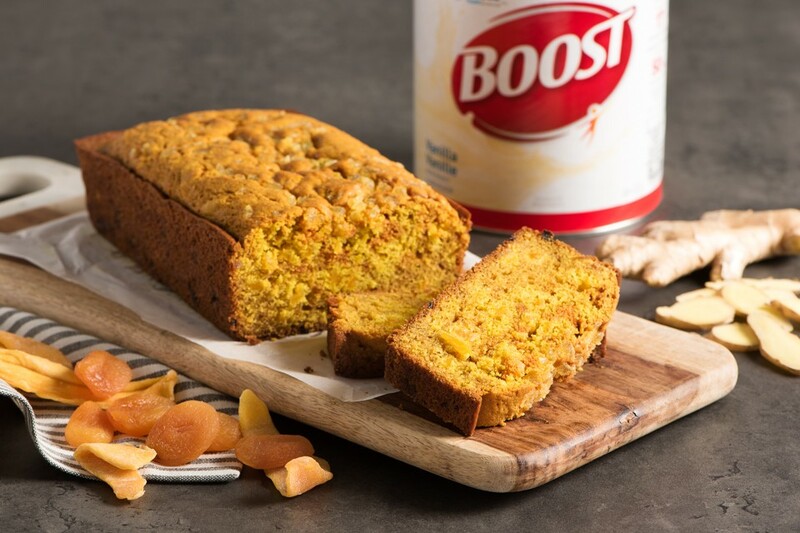 Stir in BOOST® Powder Vanilla, all-purpose flour, whole wheat flour and salt just until combined (small lumps are okay). Stir in apricots and mango. Scrape into prepared pan. Sprinkle with candied ginger. Bake for 50 to 60 minutes or until a toothpick comes out clean when inserted into centre of loaf. Cool in pan for 10 minutes before turning out onto a wire rack to cool. Serve warm or cool completely. Recipe can be prepared with just whole-wheat flour; the loaf will just be slightly denser.